Recipes for cooking with Calamondin, the small, sour, orange that can be grown indoors. Well known in the Phillipines and US, Calamondins are now becoming available in Europe. Here are a selection of recipes for people who have spotted the little sour orange fruit in garden centres, but have been unsure what they were, or what they can do with them. This article offers some recipes and resources for people trying to cook their Calamondins - or deal with an excess of fruit! Because Calamondin are not very well known in Europe, some gardeners mistake them for Kumquats, as both are small citrus fruit trees with orange fruit, but the two are very different. Calamondins are not kumquats - kumquats have a different internal structure (only 4 segments) and thicker peel, while Calamondins are more like miniature oranges, and have seeds internally. Importantly to cooks, the flavour is completely different. Kumquats are sweet while Calamondins are exceptionally sour. If you use a Calamondin in a recipe, the effect is closer to using a whole full size lemon. Calamondin can be used to cook while still green, but the flavour will be even sharper. When orange, they are comparable to lemons. When green, it is closer to limes, and the peel is far less sweet. Calamondins can be eaten raw. Despite their resemblance to oranges, they taste completely different - the peel is sweet, but the fruit is sour. It is often suggested that you should eat them whole, spitting out the seeds. As a variation, they can be frozen whole and used in drinks, desserts and cocktails as an edible garnish. Be warned - as sillysocks video shows, if you aren't ready for the taste it can surprise you! Candied Citrus slices or segments are a common recipe. However you can also "candy" slices of Calamondin, despite their smaller size. These slices can be eaten as snacks, or used as garnish. Combined with a sorbet or as a sour garnish on ice cream, they can be very nice. The recipe below makes enough for a small snack, split four ways. If you want to make more, to make more syrup simply keep a ratio of 2:1 sugar/water. Remember melted sugar is very hot, so take care. A light treat or a nice dessert! Clean the Calamondin. You do not need to remove the peel, but scrub it thoroughly clean. For this recipe it is easier to use larger fruit. Slice the fruit horizontally, giving you a star shaped cross section. Go for slices about a quarter inch thick, and discard the top and bottom of the fruit. Remove the seeds. Due to the number and size, this can leave the Calamondin slices looking rather holey! Mix the sugar and water in a warm saucepan, and stir gently over a low heat until sugar is dissolved. Once it is ready (the segments will look translucent) remove from pan wih a spatula and leave them to cool on racks. Warning: These will be very hot! As a citrus fruit, Calamondins can be used in almost any citrus recipe. If you want to use them as a substitute, remember first that they are tart not sweet, and second that as they are much smaller you will need a greater quantity of them. If the recipe requests the juice of one lemon, you may need two or three Calamondins to make up the amount. Lemonade - that's right, you can make a drink out of Calamondins. I can't say I've ever tried this recipe, but it looks interesting! 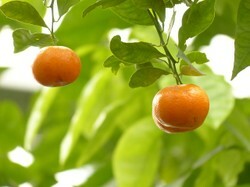 Calamondin juice can be used to enhance the flavour of Soy Sauce. Add the juice to the soy to taste. The resulting mix is often used with chicken or fish. As a flexible fruit, already extremely popular in the Phillipines, there are a lot of recipes for Calamondins. Here are a few links if you are looking for ideas about what to do with yours. Enjoy special collection of trusted calamondin orange cake recipes submitted, reviewed and rated by ifood.tv community. Meet people trying calamondin orange cake recipes. Recipelink.com - A-Z Site Index to The Recipe Link - All Calamondin recipes. If you would like to try these recipes, you can get Calamondin trees from many garden centres. Alternatively, you can buy them as seed or tree online, although growing a Calamondin tree from seed can take years before it produces fruit. Amazon has a range available across Europe and America:. Tried these recipes? Have a few of your own to add? Anything you'd like me to add? Thanks for the comment. Ber is very similar, but it's not quite the same plant. Ber is Ziziphus Mauritiana, and Calamondin are Citrofortunella microcarpa. You can tell the difference if you eat one - if it makes you reach for sugar, it's a calamondon! (I've never managed to grow Ber, they don't like the British climate much). I think the calamondin you are talking about also grows in India. It resembles a fruit we call "Ber" or "Bor". I love to eat it raw, it has a sweet-sour taste. Calamondin is a small sour orange. A small citrus fruit tree, often grown in the Phillipines, Calamondin (also called Calamansi) are ideal for growing indoors in colder climates.